For riders who require top performance and reliability from their motorcycle. Sold as convenient "everything you need in one" kits for a variety of makes and models, Gecko clutch parts are listed to classic, modern and import bikes. The Gecko range includes natural cork based friction plates, steel plates and heavy-duty clutch springs. The FP series bites hard, delivering maximum performance through use of the same natural cork-based materials as most original equipment friction plates. All Gecko tempered steel clutch plates are oil grooved. They have inner and outer teeth, slots and lugs where applicable. All Gecko clutch plates are produced the the exact thickness and size specifications for each model so that they can be built to the original assembled stack height. They are suitable for use with the original equipment clutch basket, inner hub and pressure plate. 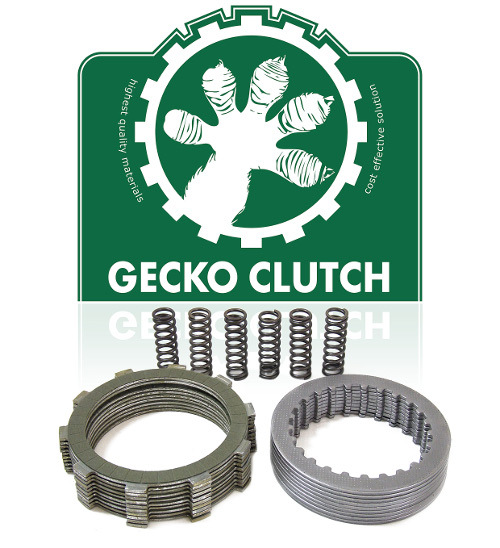 Gecko clutch spring sets come with various lengths, diameters and numbers of springs to suit each application. They have an exceptionally high tensile strength and are extremely resistant to corrosion, offering great grip, pressure and response. For more information, visit the Gecko website.